Google has added voice and video chat to their web based Gmail a while back. But, this required both parties at be at their computers to be able to communicate. They had added the ability to send free SMS messages right from within Gmail too. Now, they have added the ability to call any phone from within Gmail! In fact, atleast for the rest of 2010, calls within US and Canada are going to be FREE! 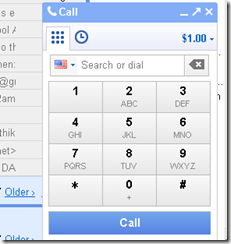 Once you install the voice and video plugin for your browser, you will see a Call Phone button in your chat window. You can dial any number in the numeric keypad or just type in your contact name and pick a number you have attached to a contact. If you have a Google Voice number associated with your Gmail account, then your outgoing caller id will have your Google Voice number automatically. 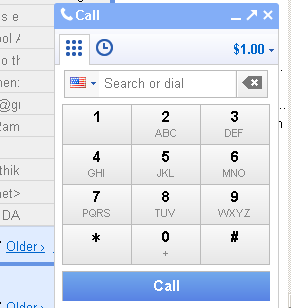 You can also choose to receive calls to this number right inside of Gmail! If you have a US based Gmail account, you will start seeing this feature in the next few days. My account already had it when I tried this afternoon.